Some digital cameras come with electronic viewfinders (EVFs), which work like optical viewfinders but use an electronic display to show you the image. Because EVFs form an image by using the signal from the sensor, they offer a potentially more accurate picture-taking experience. However, poorly designed EVFs can be a pain to use, so examine the view before you sink your money into the camera. Make sure your view is as large and sharp as possible. 2Look for an extended eyepoint. You might not be able to (or want to) press your eyeball up to the viewfinder window. 3Make sure you can turn off your EVF’s readouts. EVFs usually contain a lot of information, as shown in this figure. You should be able to turn off these distracting elements when you don’t want to see them. Some eyepieces for EVFs can swivel 90 degrees to allow taking pictures from especially low or high angles. 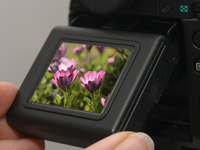 5Evaluate the size and resolution of the EVF. 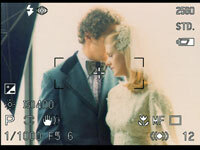 A high-resolution electronic viewfinder (like the one in this figure) is easier to see to discern detail and more reliable when used for focusing. 6Test the EVF for an accurate viewpoint and resolution. 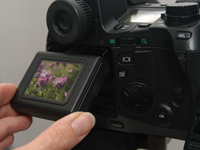 EVFs don’t always display 100 percent of the sensor’s view. Also, the image you see might not be exactly like your final photograph, but the results should be close.